John Harris was the surveyor appointed to be the Commissioner for the Enclosure of the commons of Sutton Coldfield by Act of Parliament dated 1824. One of his first duties was to define the boundaries of Sutton, and he did this by making a perambulation or beating of the bounds, completed on October 5th 1824. He described the bounds in great detail. Going west from Walmley Ash there was common land on the Sutton side and farmland over the boundary in Minworth; the strip of common on the Sutton side was known as Willetts Gorse. The 1824 map shows that Willetts Gorse widens out to a broader stretch of common called Bury’s Field, and the boundary follows the southern edge of this common nearly as far as Eachelhurst Road, when it turns sharply southwards. To the west is a large common known as the Eachelhurst Field (now a golf course) which is surrounded by a ribbon of small fields and cottage land, and the boundary follows the outer edge of these holdings. The area on the Minworth side was known as Cat Hill, and the boundary continues along the edge of Minworth, across “the mill fleam which runs to Plants Forge” to the E Brook. 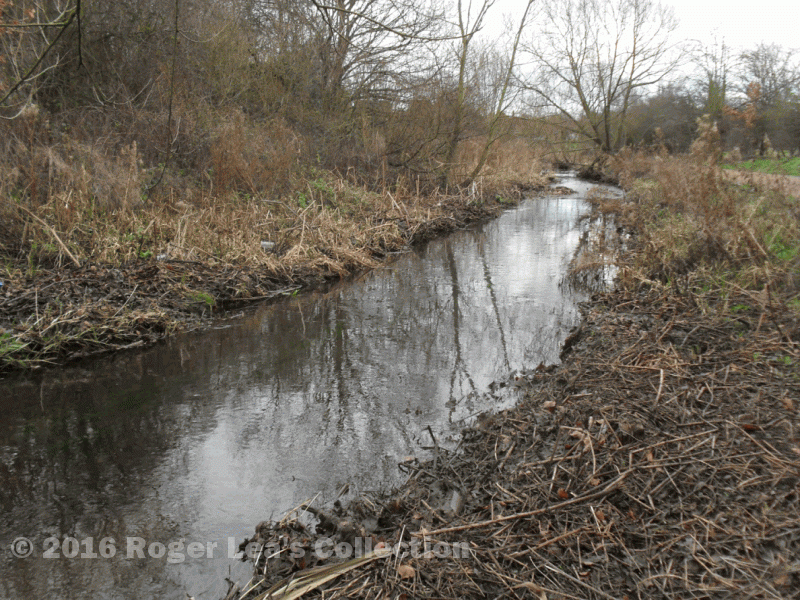 For centuries Plants Brook was known as E Brook, and followed a winding course, not its present artificial channel. In the thirteenth century the Earl of Warwick gave the Ardens of Peddimore licence to catch fish in the E Brook, so perhaps it was a trout stream then. From here the brook flows on through the nature reserve and then beneath Castle Vale to the Tame, being the old boundary of the hamlet of Minworth; Minworth was incorporated into Sutton in 1923. Before reaching the E Brook Mr. Harris had crossed Eachelhurst Road, described as “the lane leading from Eachelhurst to Berwood Common”. The Manor of Berwood lay to the south of the brook, between Minworth and Erdington - in the Middle Ages it had belonged to the Priors of Leicester, who had a big dairy farm there. Soon he left Berwood behind and Pype Hayes Park in Erdington lay to the south of the brook. The land on the Sutton side was known as Eachelhurst Bottoms, which were once part of the common called Eachelhurst Field. The Corporation of Sutton drained the bottoms and turned them into meadow land in the 1730s, intending to use the rental income to maintain the workhouse then being built. There was also a plan to build a water mill there, but it could not be done without cutting off the supply of water in the leat leading to the mill at Plant’s Forge. The bottoms have gone back to the wild now, forming an area of scrubland at the edge of the golf course. The E Brook at Eachelhurst. 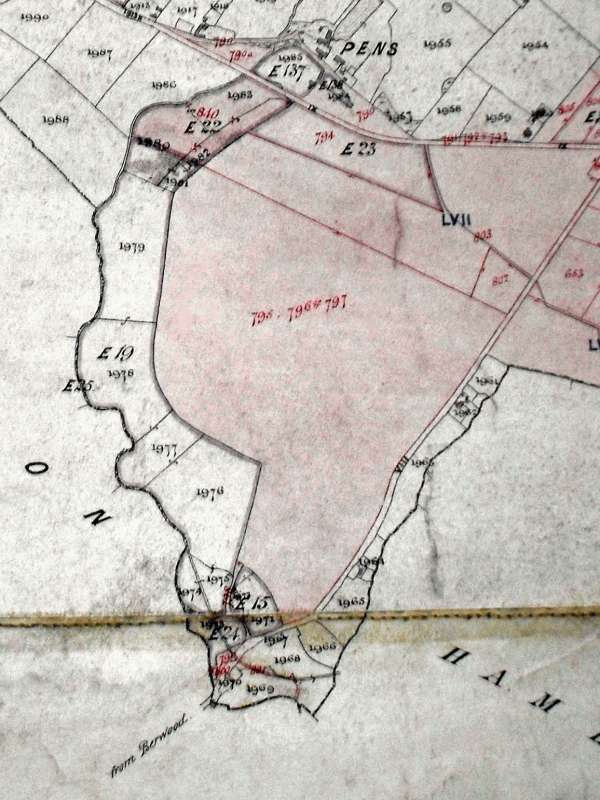 Part of the 1824 Corn Rent map, showing the Eachelhurst Field to the south of Penns Lane - the commons are shaded pink.